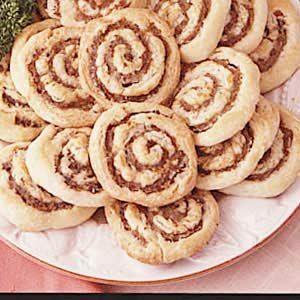 These sausage pinwheels have been around a while. My mother used to make them when I was little, and she’d wrap the uncooked rolls in wax paper, and then tie the ends with ribbon. Then she’d freeze them and give them as Christmas presents. What a lovely gift for someone to enjoy Christmas morning! Cut into shortening until mixture resembles coarse meal. Add milk, stirring until well blended. Turn dough out onto a lightly floured surface. Knead lightly 3 or 4 times. Roll dough into an 18″x12″ rectangle. Spread sausage and cheese (if using) over dough, leaving a 1/2″ margin on sides. Roll dough lengthwise, jelly fashion, pinch seams and ends to seal. Cover and refrigerate for at least 1 hour. Slice into 1/4″ slices. Bake at 350 degrees F for 20 minutes or until brown. ***Note: these are easy to overcook. Depending on how thick you slice them, adjust your cooking time accordingly. Makes about 3 1/2 dozen. Can be made ahead and frozen.